I love the colors and quality. I call it my happy rug and it brightens my whole living room. 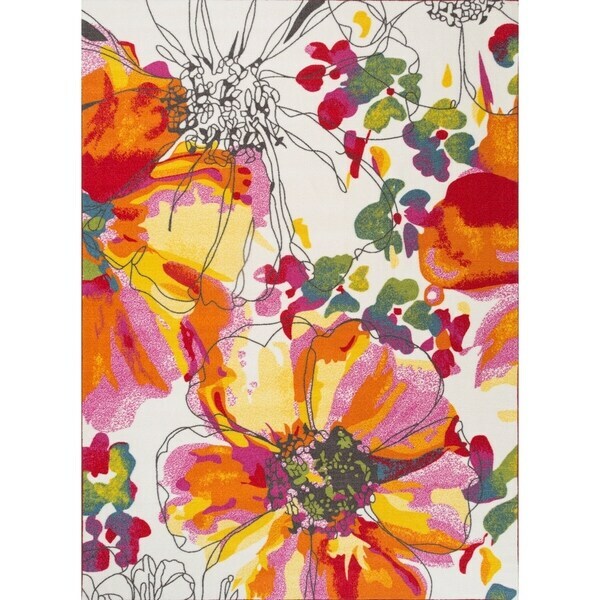 Make a modern statement with this eye-catching abstract area rug from OSTI. The soft nylon pile features a large-scale floral print with black linear accents. This stain-resistant piece comes in two color options and four sizes to fit your space. Fits my kitchen perfectly. Great for it to be non-skid and non-slip. Highly recommended. This just changed the entire energy in place ! So colorful made my kitchen look happy !! The material is excellent the colors are adorable I would definitely recommend . Bought this for my entryway. Beautiful colors. Brightens up the area. Good quality with a non-skid backing. I got this for my laminate floors in the dining room but instead will use it on the carpeted hallway from the bedroom to the bathroom. It is just as I saw on my computer. Bright orange and other colors swirling around. WIll be a joy to see it every day when toodling arounf the house. Non-skid backing is perfect if I decide to move it back to the kitchen area. Well packaged and unrolled with minimal curling once laid out. File cabinets perfect to weight it down and not be a tripping hazard. 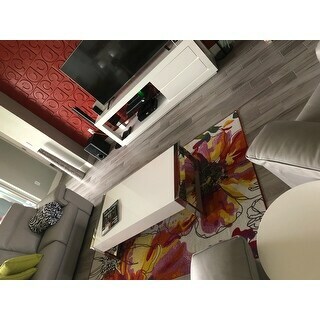 Love the wild ness of the design as my aesthetics in my new house (Jun2017) is bright ness and joy in colors. 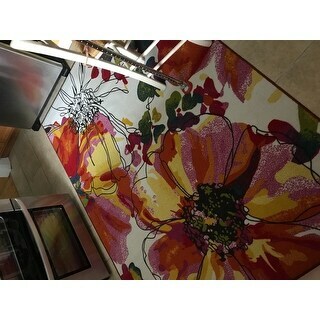 I am an abstract artist and paint in 3-D acrylics so this rug brightens up my life daily. Am working on a mural of quasi palm trees and sunset on a wall in my 2-car garage. Maybe this rug will migrate to the entrance to the house from the garage. Very versitile. The rug is very pretty, but there are 2 things that aren't true to the photo. 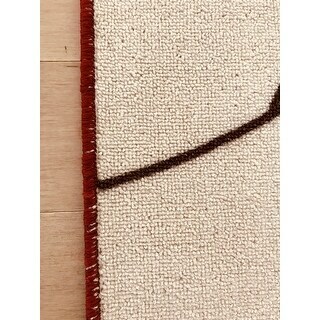 There is a deep red (almost maroon) edging that doesn't match the carpet well and is bolder than in the photo. It takes away from the beauty. The other thing is what appear to be black drawn lines in the photo (which I loved) are actually a deep brown (which I don't love). The rug lays beautifully. It's nice and thin and spot cleans nicely. Love the colors and the non skid backing! This rug is a bold statement. It looked nice in person. The rug itself is quite thin, which I actually liked as it was less heavy. The colors are slightly different from the picture - mine were more muted and dark, rather than the bright exuberance in the photo.The pattern is very asymmetrical so be careful of what portions will be covered in your layout. I liked it, but returned it because the colors clashed with the room wall. Just a beautiful rug. Very bright colors. It’s thin but I bought the largest one so it’s easy to move. I’m putting it under my dining room table. It brightens to whole place up. There is a lot of white in the rug, so I wouldn’t recommend it for high traffic areas. This rug came really fast - in time for my party! Everyone likes the bold colors which are just as bold in person as on the web page. My only concern is that it is 100% nylon and I'm wondering if I will have a problem getting shocked in the winter. Other than that, it lays nice and flat and makes a nice statement when folks walk in my front door. I love this rug! The colors are so vivid and will go with most anything. I currently have swivel chairs in a gray wool herringbone. It is an unusual combination but looks awesome. The modern but conservative chairs are the perfect counterpoint to the bright colors while picking up the black squiggly lines running through it. A match made in heaven. The white background with the looseness of the print makes it appear much lighter than you would think a large vivid floral would be. Very breezy, airy and light like in a sunlit garden. 💕the brilliant colors, even prettier in person. Lays flat immediately. Looks great in my small kitchen and the price is amazing!! Amazingly beautiful! This rug has exceed my expectations. 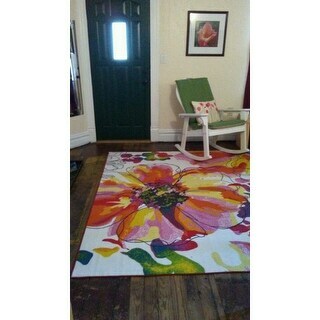 My sun room looks amazing after added this rug with such vibrant colors. I have received so many compliments. Its super light and thin and has a rubber backing. Its more like a mat than a rug. I imagine it will be super easy to clean. Ordered this for a travel trailer. Fits perfectly down the center of the trailer. Vibrant color. 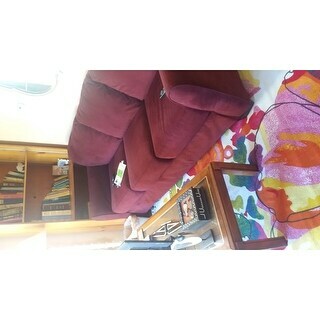 Nice bright rug with a very low nap and vinyl back. I purchase this rug for my very large bathroom. Prefect to get a little moisture and stay in place. I bought this for my girls’ bedroom. They love it, I love it and it fits perfectly. I wish it was a little thicker because it always gets pulled up by the vacuum but overall it’s a great rug and value. It's bright! I put it on my deck and was disappointed that it got sopping wet when it rained. It is not an outdoor rug. It's thin with a rubber backing. Still pretty, but I can't leave it out. Very bright. Had to tape ends down until they lay flat but I love the rugs. This rug is great. It wakes up those late for the party in ana entry hall. I love it and I will have a ball decorating a room to match this hall! I think runners are great to define space that are small. Why not buy one and have a ball decorating your own hall. Thanks Penni for suggesting this special rug! "Can this rug be cleaned in the clothes washer?" Yes, this rug is machine washable. I have washed mine several times and it has not faded at all and holds up well. 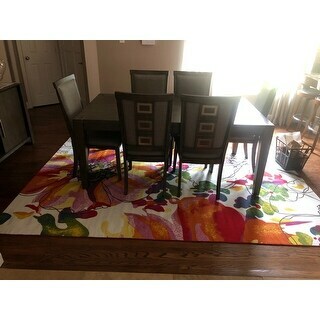 Love the colors and have the runner in my kitchen. I would't put this rug in the washer, but that's up to you. I found that it doesn't take much to just "dab" out a spot, and since I use mine in the kitchen, I just use my sweeper to pick up crumbs, etc. I don't expect this rug to last forever so I'm not too worried about everyday use and wear. It's a great rug to punch up color wherever you lay it. "Is the runner machine washable?" "Is this indoor/outdoor? I ordered this to put outside on my covered deck. Thx"
The backing for the rug has the potential of becoming a mold/mildew breeder, especially if you are in a humid or wet climate. If your porch will stay dry, this could potentially be a good rug for the space. It is extremely thin, however, and snags/runs easily. "Is this for outdoor use? Does it soak up water or dry decent?" "Could this runner be used on stairs? Karen"
NO. It would be a major tripping hazard. Stairs are for installed carpet by professionals. In theory: if you used a super heavy-duty staple gun or nail gun, then Maybe.â But it is a RUNNER for a hallway or as I have mine covering the space between the kitchen and dining room. Bright and stylisitic. I like the compactness of the design in the runner. Personally, the larger 5x7 size is distracting as the pattern becomes too spaced out and the calmness of its aura is lost in translation to the size of the rug. Stick with this as a runner. ENJOY. "What are the dimensions of this colourful rug?" Your kitchen is more than the place where you cook meals and share them with your family. It’s where your kids’ artwork hangs next to your souvenir magnets. It’s where laughs and love are shared and memories are made. Finding a perfect kitchen rug will give your kitchen the inviting feel of a gathering space while protecting floors from high foot traffic. Whether your kitchen floor is hardwood, linoleum, or tile, adding a kitchen rug will give you the benefits of noise reduction and a little cushioning for your feet. Follow these tips to ensure you pick the perfect kitchen rug that does what you need it to and looks good doing it.